Just because food comes in a can doesn't mean you should forgo food safety precautions as even canned foods can make you sick sometimes. It's important to understand canned food safety so you can keep your family healthy. Are All Canned Foods Shelf Stable? Most canned foods are shelf stable and can be stored for long periods in room temperature (no refrigeration required), which is one benefit of using canned foods over fresh foods. In addition to canned foods, other non-perishable (shelf stable) items include jerky, bottled foods, pasta, rice, spices, oils, sugar, and flour. Certain canned foods (some canned hams and seafood, for example) aren't shelf stable and need to be refrigerated, but these foods will be labeled "keep refrigerated." Canning food helps prevent microorganisms from growing (preserving shelf life) in a number of ways. The food is heat processed at very high temperatures (240 to 250 degrees Fahrenheit) to destroy microorganisms, and vacuum-sealed to prevent new microorganisms from entering the cans. However, once you open a can or break the seal, you must refrigerate the food and use it within several days. Be extremely careful when canning your own foods, as bacteria (Clostridium botulinum) that cause botulism can lurk in improperly home canned foods. Botulism is a rare form of food poisoning that can cause paralysis and even death, so it's important to know the risks and take proper precautions. Bacteria must be destroyed during canning, as you can't tell by looking at, smelling, or tasting canned food the botulism toxin is present. High-acid foods can be canned in boiling water, but low-acid foods must be processed in pressure canners to reach temperatures of at least 240 degrees Fahrenheit. To learn about the specifics, the USDA provides a complete guide to home canning. According to the USDA, you can store unused canned food (still in the can) in the refrigerator, but it's not ideal. To preserve the best flavor and quality of food (and prevent materials from the can from leaching into food), remove the foods from the can and place them in plastic or glass containers before refrigerating these leftover items. Meats and low-acid foods will keep for three to four days, and high-acid canned foods will keep in the fridge for five to seven days. Foods in cans that have small dents (but otherwise look okay) are generally safe to eat. However, the USDA says if a dent is large enough to lay a finger into, throw that canned food out. 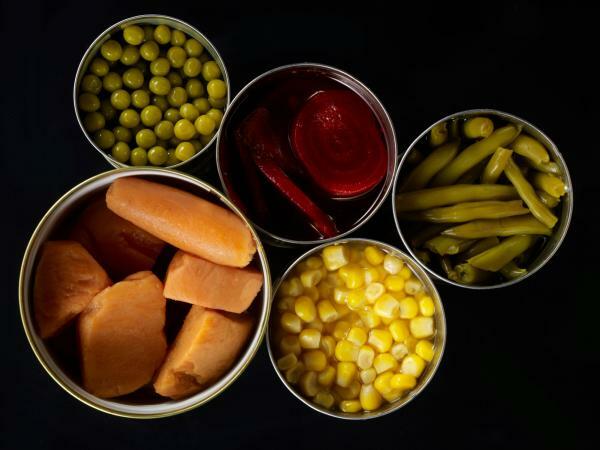 Store canned foods in room temperature rather than freezing them. If canned foods are accidentally frozen (left in a car in freezing temperatures, for example), these cans can swell. Cans of food contaminated with botulism can also swell, so always toss out canned foods that are bulging in any way. The USDA says frozen cans (that haven't previously been thawed and aren't bulging) can be defrosted in the refrigerator and the food content used (after being boiled for 10 to 20 minutes), but only if the food looks and smells normal. Choosing canned foods (or canning your own) is an excellent way to extend their shelf-life, which may eliminate food waste and allow you to grocery shop less frequently. Likewise, many canned foods can be part of a soft food diet. However, use caution when canning your own foods to prevent botulism poisoning, and toss out cans that are severely damaged, rusting, bulging, or have large dents. Because many canned foods are higher in sodium than fresh foods, be sure your daily sodium intake doesn't exceed sodium guidelines to keep disease risks low.